In a close battle between an album or movie posters from 2012, posters won. Why? Because posters are slightly more fun, even if it meant browsing through lots of posters from that year (take a look yourself). I don’t write about all of them, obviously, but just a selection of the good, the bad and the most photoshopped. Battleship. Well, how to start? This is probably one of the most ridiculed movies before it came out and it is basically impossible to take it seriously. It’s a movie version of Battleship, so what could you possibly expect? The story is absurd, the filmmaking is almost irrelevant, there are some moments that could be seen as entertaining, but, come on, no one needed this movie. It’s not the worst; it’s just dumb and unnecessary. Oh, the plot? Aliens attack, battleships fight them back. Liam Neeson is just there for the paycheck, but not for the actual movie. What else do you need to know? Oh, yes, two in a row. 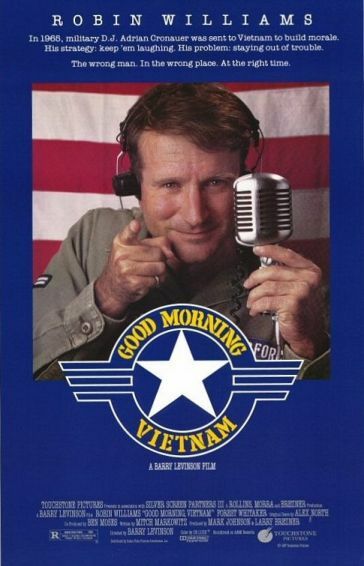 After Dead Poets Society (and a lack of new movies to talk about), I decided to look at the other Robin Williams movie from the late 80s that had a huge impact on me: Good Morning, Vietnam. I saw it around the same time as Dead Poets Society and it cemented Robin Williams as one of my personal heroes of my late childhood. It is also a strange movie to watch at 12 when the Vietnam War is only something abstract I had no relation to. But around the same time I must have watched Apocalypse Now on repeat, so something must have been set into place there for my interest in this war and the dark sides of U.S. history. But this movie is mainly a comedy and primarily because it’s Robin Williams’ show. And in many ways this movie resembles Dead Poets Society in its structure: Williams plays the offbeat character that overthrows conventions, he has to fight against authority and has to pay for it in the end, nevertheless teaching everyone willing to listen something about being different. One more reason for doing this double feature.